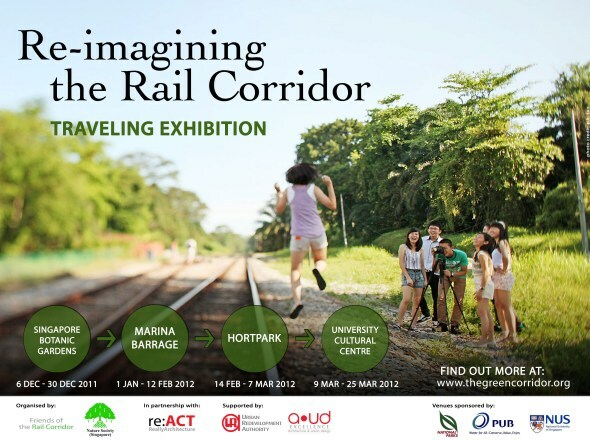 12 March 2012 – The Urban Redevelopment Authority (URA) is pleased to announce that the winners of the “Journey of Possibilities” Ideas Competition for the Rail Corridor will be unveiled on 30 March 2012 (Friday). On that day, the winners will be sharing their ideas at a Presentation which will be held at the URA Centre from 7pm to 9pm. The public is invited to attend this session to learn more about the winners’ innovative solutions and ideas in addressing some of the key challenges/issues that were identified earlier for the Rail Corridor. 9 January 2012 – The Singapore Land Authority (SLA) has completed removal works along the former railway land. The railway tracks and ancillary structures were handed over to Malaysia on schedule by 31 December 2011, as agreed. The land has been levelled and turfed. 2. From today onwards, the public can enjoy free access to the Rail Corridor, with the exception of three sites along the Rail Corridor and the Tanjong Pagar Railway Station (TPRS). 3. Following the opening of the former Bukit Timah Railway Station and railway land extending 1.4km southwards from the steel bridge along Bukit Timah Road to the public on 16 September 2011, SLA has identified three sites along the Rail Corridor and adjacent vacant state land for interim community use. These sites are near Jalan Hang Jebat, Ghim Moh Road and Kampong Bahru Flyover. Maps showing the locations of the community use sites are at Annex A. 4. SLA is carrying out improvement works at these sites, which have been cordoned off for safety reasons. The sites will be progressively opened for interim community use from April 2012. The public will be able to enjoy free access to these sites for recreational activities with no advance booking required. These sites will be available until the long term development plans for the Rail Corridor and its immediate surroundings have been determined. More information on community use sites can be found on http://www.sla.gov.sg/htm/ser/ser0208.htm. 5. TPRS will remain closed at this time to enable SLA to carry out maintenance works and structural inspection. Information on its re-opening will be provided to the public in due course. 6. The public are advised to exercise caution and be responsible for their own safety when accessing the Rail Corridor. They are also reminded not to litter or deface the railway structures. 7. The Urban Redevelopment Authority (URA) is undertaking a comprehensive review of development plans for the former railway land and their surrounding areas. As part of its review, URA will study the proposal to maintain a continuous green link along the Rail Corridor while balancing the need for development. The public is welcome to provide suggestions and ideas on the future use of the Rail Corridor to enhance our living environment. For more information, please log onto http://www.ura.gov.sg/railcorridor. By Grace Chua, The Straits Times, 9 Jan 2012. The Rail Corridor – the snaking, 26km tract of former Keretapi Tanah Melayu (KTM) railway land – is open to the public from Monday, with the exception of four areas. For the past half-year, the authorities had been removing old railway tracks and equipment as well as levelling and turfing over the land parcel, which runs from Tanjong Pagar to Woodlands. Press Release by URA, 30 Nov 2011. The Urban Redevelopment Authority (URA) announced today the launch of an Ideas Competition titled “Journey of Possibilities” for the Rail Corridor. The Ideas Competition is intended to draw innovative and fresh new ideas from the public in addressing some of the key challenges and issues in planning for the future use of the Rail Corridor.